Founded in 1923, Nahalal was the first residential agricultural girls' school in the Holy Land, and shortly afterward was adopted by Canadian Hadassah WIZO as its first project. Today the school is co-educational semi-residential high school with a broad curriculum serving over 1,100 high-school students, including 187 boarders. This special school accommodates diligent students youngsters from established homes or welfare referrals, gifted children and pupils with learning disabilities, who all come together to learn, share, and develop skills under the auspices of WIZO. The school had built a new auditorium for multimedia and audio-visual lessons. The teachers are using various materials and require many AV applications. The school was looking for a lectern solution that will be both representative in design and will provide a complete AV solution to all materials brought in by the teachers. 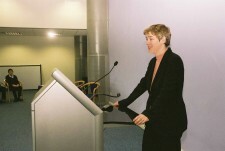 The most important requirement was for the lectern to be easy to use, protected and accessible to every teacher. Once the school management was presented with TechPod, they knew it's what they needed..
TecPodium Lectern was installed in the auditorium offering an easy to use complete AV solution, allowing both teachers and students to use it freely and frequently. The auditorium became the most desirable lecture location in the school. Teachers are using all TecPodium functions easily and students enjoy various interesting multimedia presentations. The school reports that since TecPodium was installed, the auditorium is working at its maximum capacity. Following teachers demand and student's satisfaction, the school is now planning to install more TecPodium Lecterns. "TecPodium has proven to be the perfect solution for our purposes. TecPodium is a great tool for both teachers and students who bless me after every lecture… The lessons become more active and involve the students. The school is performing many ceremonies and guest-lectures throughout the year and TecPodium allows us to conduct these events at the highest standards of performance with peace of mind. Anyone can use it without instructions, which makes it an ideal tool for our guest lectures. I will definitely recommend TecPodium to any school manager!" It's so easy, everyone loves it!